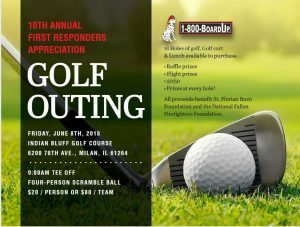 May 30, 2018 – Werner Restoration Services, a member company of DKI, North America’s largest disaster restoration contracting organization, along with 1-800-BOARDUP of the Quad Cities, announced that their 10th annual First Responders Appreciation Golf Outing will be held on June 8, 2018 at Indian Bluff Golf Course in Milan, IL. To support and honor of all of America’s fallen firefighters and those families and children who have been affected by fire, all proceeds raised by the outing will be given to the National Fallen Firefighters and St. Florian Fire and Burn Foundations. Werner Restoration and 1-800-BOARDUP welcome all active and retired first responders, along with their families, to join the event. Contact Jaclyn Thompson with Werner Restoration at email protected for more information. Werner Restoration Services is the premier water and fire damage restoration company in the Quad Cities and its surrounding areas. They are a family owned company providing help after a disaster affects families or other businesses. To learn more, visit www.wernerrestorationinc.com. 1-800-BOARDUP specializes in emergency response services for disasters. Established in 2002 with nationwide locations, they assist organizations who share their commitment in helping victims of disaster. To learn more, visit 1-800boardup.com. The National Fallen Firefighters Foundation was founded to lead a nationwide effort to remember America’s fallen firefighters. Since 1992, this tax-exempt, nonprofit foundation has developed and expanded programs to honor our fallen fire heroes and assist their families and coworkers. To learn more, visit www.firehero.org. St. Florian Fire and Burn Foundation was founded in 1993 with the mission to reduce the number of injuries and deaths associated with burn trauma through education and research, and to assist burn survivors and their families in maintaining a high quality of life. The foundation covers Iowa, South Dakota and Nebraska. To learn more, visit stflorianfireandburnfoundation.com.